Uncertain what to do with herself, and her appetite momentarily lost, The'ara dashed over to Jerri. Putting on a big smile, she grabbed and shook her hand, giving it a series of over-zealous pumps. "You must be the famous Jerri. My compliments to the chef. My goodness, I only had your stew, but that was the best stew I've ever had. 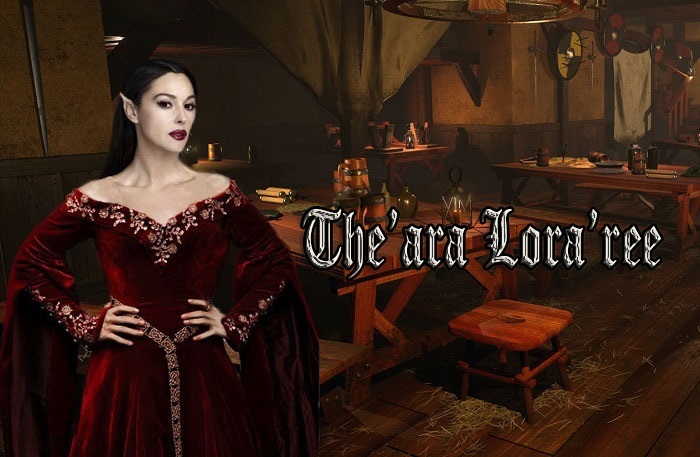 My name is The'ara Lora'ree and I'm a traveling minstrel and I've been in a lot of taverns and that stew is just incredible. Um, have you, um, worked here long?" She finally stopped shaking the poor woman's hand and grabbed an empty plate, hugging it to her chest for comfort. Her eyes drifted over the buffet table. It was indeed quite a spread, and she wondered if maybe she should grab a huge helping of cake and rage-eat it in frustration until she felt better. The'ara had made an assumption and mentally kicked herself. Why did she assume Chez wanted anything more than a kiss and someone to flirt with for the evening? And now what she perceived as rejection stung. Her eyes traversed toward the front door. She could use the cold wintry air to sober up, but no doubt that might lead to a certain someone asking her if something was wrong--a conversation she did not want. Her eyes then flashed toward the stairs. Equally obvious would be to disappear into her room. Like it or not, if she wanted to appear like everything was fine, she was trapped where she was.